Can you say - "UNDEFEATED" this season?? 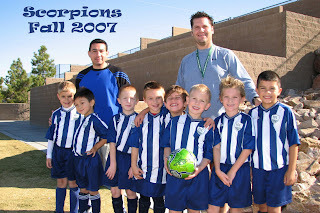 Connor's soccer team (or should I say - Bill's) played their final game of the season and creamed the other team 7 to 1. So to date that puts their standings for the last 5 seasons - 1 loss, 1 tie, and 48 wins. Holy Cow! Scorpions Rule!! We had an end-of-season party for the boys at PumpItUp. Here are some pictures.